The Plug5 Plus with Power Module gives you the ability to charge your mobile phone or GPS while you ride by converting the AC from a hub dynamo into DC at 5 volts and a maximum of 1.2 amps. Most devices that charge via USB can be charged by the Plug5 Plus. And the Plug5 Plus incorporates a battery to keep your device charging while climbing steep hills or stopped. 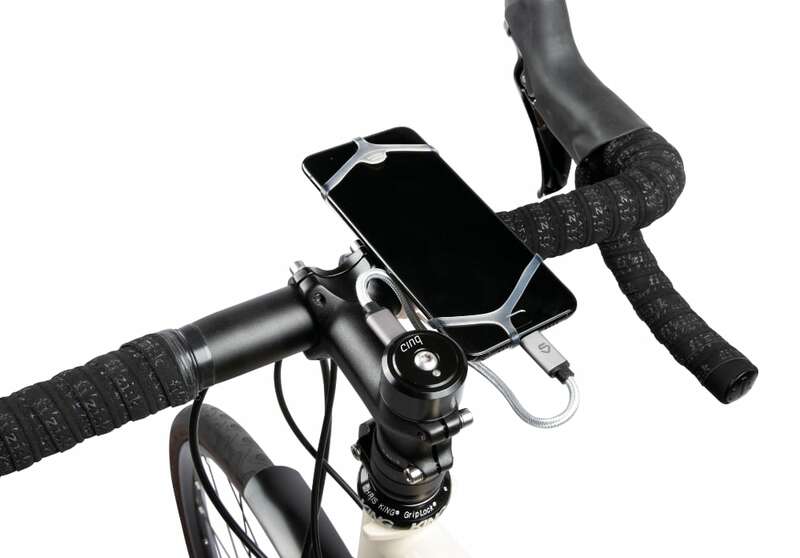 A mobile phone running mapping software uses a lot of power; more power than a bicycle hub dynamo can provide. So you can use the power from the hub dynamo to partially offset the power drain while running mapping software, but you won't be able to increase the charge on the phone's battery while running mapping software. The same is true when running a Garmin GPS. 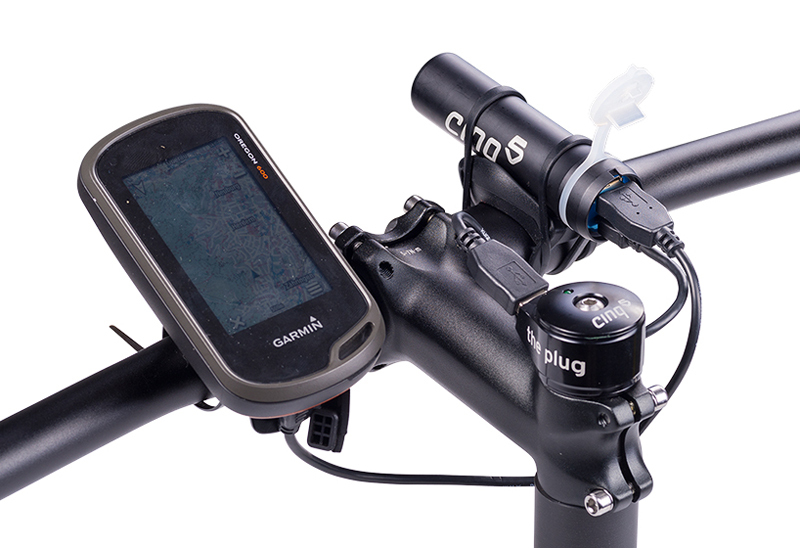 So the hub dynamo with a charger such as the Plug5 Plus can extend the run time of the phone or Garmin GPS. Of course if your phone isn't running mapping software, or if your Garmin is switched off, you can easily increase the charge on the device. So people who need to check their position while on a ride will not drain their device's battery while charging from the Plug5 Plus. The output port is USB-C, the latest standard, and is positioned at the top of the steerer tube. 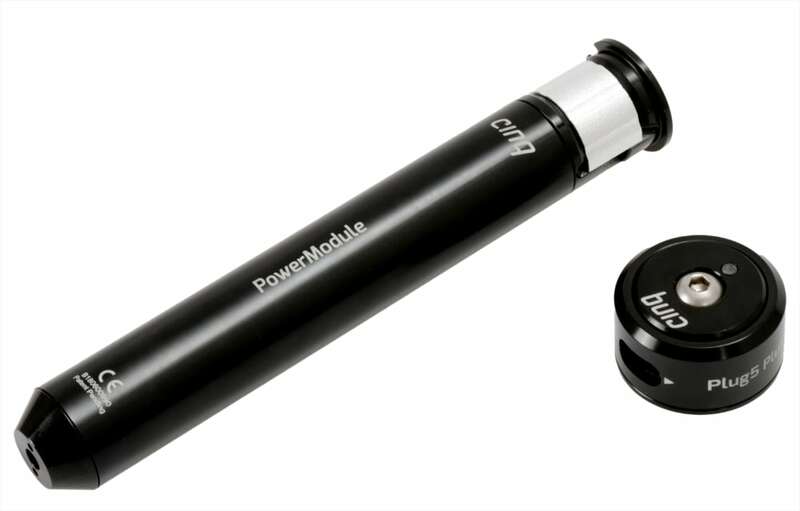 The Power Module section fits inside the 1-1/8" steerer tube on most modern bikes. So once installed you'll never see it. The length of the Power Module is 160mm. Add another inch for the wiring. So your steerer tube needs to be a bit over 7 inches to fit the Power Bank. Very few bikes would not have a long enough steerer tube. The diameter is 24.5mm, so your steerer tube must have an inner diameter greater than 24.5mm to fit. I suspect many carbon steerer tubes will be too narrow to fit the Power Module. Please carefully measure the ID of your steerer tube before ordering. Any 1-1/8" O.D. steel steerer tube should be fine. The Plug5 Plus is in stock. Your fork must be open at the bottom of the steerer tube to allow the wire to pass through. Some carbon fiber forks are sealed at the bottom of the steerer tube. So these won't work with The Plug. In that case, I recommend the E-WERK from Busch & Muller. With other chargers, if you unplug the mobile phone or GPS from the charger's output, the charger becomes inert. It doesn't use any of the hub dynamo's power. Virtually all of the dynamo's power is available for the headlight & taillight, so they are as bright as possible. This means that to switch between running your lights or charging your phone/GPS, you either turn off your headlight and plug in the phone/GPS, OR, you unplug the phone/GPS and switch on the headlight. But with the Plug5 Plus with Power Module, it's battery is always in the circuit. You can't disconnect it. So the Plug5 Plus has some electronic magic that routes almost all of the hub's power to your headlight, if your headlight is turned on. That means you can keep your phone/GPS plugged into the Plug5 Plus output, and it will have no meaningful affect on the brightness of the headlight. There is a tiny reduction in the headlight's output at low speeds but not enough to be concerned about. So plug your phone/GPS into the Plug5 Plus or don't, it really makes no difference. Simply switch your headlight on or off as needed, and the Plug5 Plus will handle the details. 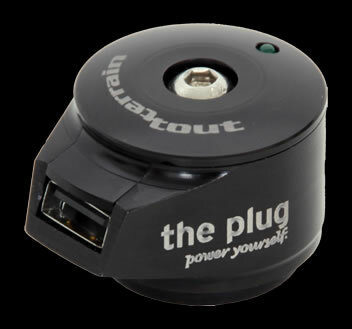 The Plug III is a device that converts the A.C. from your 6 volt, 3 watt hub or sidewall dynamo and converts it to D.C. So you can charge most devices that charge via a USB port such as a Garmin GPS or iPhone. Devices it can't charge are those that require 1 amp or more of current, such as the iPad and some phones. For example, the Galaxy S4 apparently ships with a charger that outputs 2 amps. No hub dynamo can produce that much power, so forget about charging the S4 from a bicycle dynamo. This is due to the limited output of bicycle dynamos, not any limitation of The Plug. The Plug III is installed in the steerer tube of a 1 1/8" steel threadless steerer, the most common type used on modern bicycles. It replaces the top cap of the headset. Carbon fiber and aluminum forks often have carbon fiber or aluminum steerer tubes, and the inside diameter of those steerer tubes is too small for the expander that ships with The Plug. We now have a suitable expander to work with 1 1/8" diameter carbon fiber steerer tubes. Cinq Expander for 1-1/8" carbon fiber steerer tubes. Replacement PAT Cable for The Plug III, also works with The Plug II. Replacement rubber cover for the USB port. The Cinq Power Pack II can be charged from any USB outlet on a computer, a USB charging adapter in your home, Cinq Plug III, or Busch & Muller E-WERK. Its 3,000 mAH battery can simultaneously be charged via the Plug III or E WERK while charging your mobile telephone or GPS. Cyclists find that continuously running mapping software on their mobile phones or recording a ride on your GPS drains the device's battery faster than the power from a hub dynamo can replenish it. Your device's battery will last longer than it would without the input from a hub dynamo, but if you ride long enough, its battery will still run dry. So it is helpful to have an auxilary battery in the loop. The Cinq Power Pack II to the rescue! Unless your bike has a 1 1/8" threadless steerer tube, you won't be able to use the Plug III charger to charge the Power Pack II, since the Plug II must be mounted at the top of the steerer tube. So, if you can't use the Plug III, but still want to use the Power Pack II, you can use the E WERK charger from Busch & Muller. You can now purchase the Plug III with the Smart Power Pack II, the X Mount and a USB to Micro B to A cable to connect the two, at a lower price than purchasing the items separately. All products on the Tout Terrain website which we don't keep in stock can also be ordered.